The Mount Vernon Creek trail is located in Red Rocks Park near Denver, Colorado. The trail begins at a small parking area near Entrance 2 where it travels near the creek for part of the way and then turns up towards the Lower South Parking Lot where it comes to an end. Enroute the trail is connected to by the Will Call trail that leads up to the Trading Post near the Red Rocks Amphitheatre. 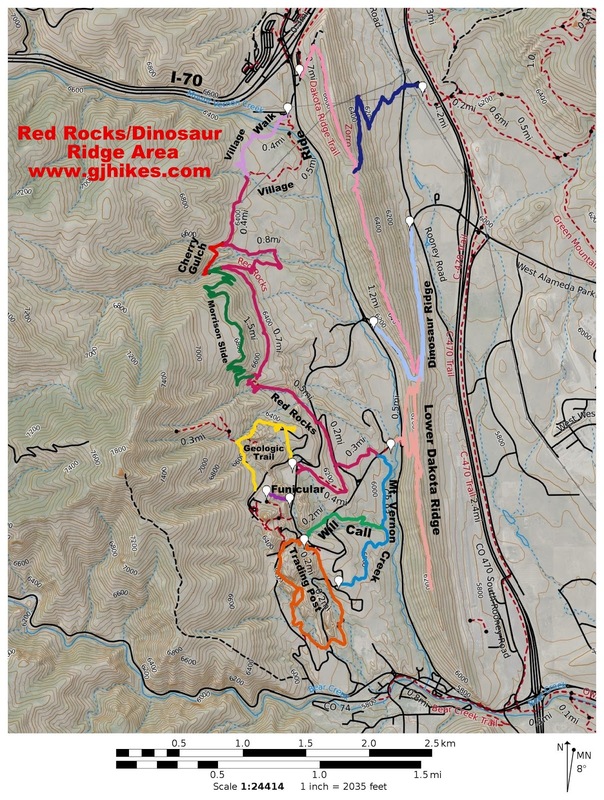 To get to the trailhead find your way to Entrance 2 of Red Rocks Park. After crossing the bridge over Mount Vernon Creek there is a small parking area on the left where the trail begins. Across the road there is a short spur that leads to the main Red Rocks trail. Hiking back towards Entrance 2 leads to the Lower Dakota Ridge trail that begins just across Highway 93. The trail starts out along a narrow path through the grass in the direction of the creek. Before getting to the creek the trail turns and travels parallel to it. The creek is obscured by a thick growth of trees and brush that create a formidable barrier that blocks any easy access to it. With only minor changes in elevation the trail is pretty easy to hike. Stairs made from beams of wood create an easy transition across a stream that trickles by just before reaching the trails junction with the Will Call trail. After crossing the stream the trail climbs its only rough section that gets it up and out of the wash. From here there is a nice view of the Red Rocks Amphitheatre which is nestled between Ship Rock on the left and Creation Rock on the right. The final stretch of the trail continues to bend away from the creek where it finds grassy meadows to cross that slope off of the foothills. Blanketflowers and Indian Paintbrushes add a mix of colors to the carpet of green during the summer months. The trail comes to an end when it reaches Lower South Lot 2. From here you can pick up the Trading Post trail on the other side of the road or follow the sidewalk up to the Trading Post and Amphitheatre area. There is always the option of simply turning around and returning by the same route. 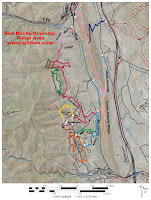 The most adventuresome route to take, if you would like to add some more distance to your hike, would be to follow the Trading Post trail either on around the park or directly up to the Trading Post and then take the Will Call trail back down to the Mount Vernon Creek trail and on back to your vehicle. It's can be nice to have plenty of options. As far as the Mount Vernon Creek trail goes if you would like to see it for yourself then all you have to do is 'Take a hike'.